This card came together sooo fast I just had to post it right away! 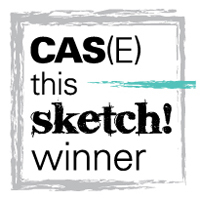 I made it for the Stamping 411 sketch#139 here. 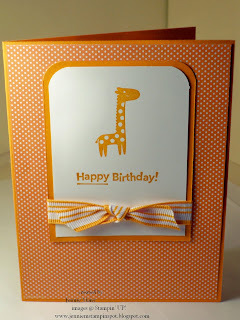 I ran a piece of Very Vanilla card stock thru the Big Shot with the Perfect Polka dots textured impressions folder. I stamped the flourish from Vintage Labels in Chocolate Chip. I cut that out and adhered it to a Chocolate Chip piece punched with the Wide Oval punch. 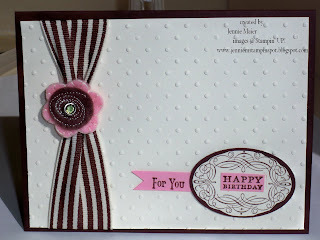 I then stamped the sentiments in Chocolate Chip on Pretty in Pink card stock then cut them out. The piece of 1 1/4 inch striped Chocolate Chip grosgrain is cinched with a flower from the Sweet Pea stitched felt. A Circle Ice green brad finishes it off! I've been cranking away at projects and things for my workshop next week. I'm leaving town for a volleyball tourney this weekend so I promise to post my hostess gift, give-aways and projects next week. Meanwhile, I made this to showcase the Shades of Spring DSP and the Extra-large two-step bird punch. 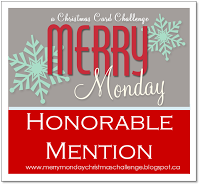 I also used the Splitcoast Sketch #269 here AND this card qualifies for the PPA#31 Inspiration Challenge here. The bird and branch easily punch out with the new XL two-step bird punch in the Mini. I stamped the sentiment from Whimsical Words in Orchid Opulence. I ran the So Saffron card stock thru the Scallop Trim border punch and layered a piece of 1/4 inch Certainly Celery grosgrain ribbon. More cards for my upcoming workshop means more Fox and Friends. I made this one with the Stamping 411 sketch from last week here. I used the monkey,cut him out and adhered him with some Stampin' dimensionals. The branch is from Cheep Talk and I colored that with Chocolate Chip and Old Olive Markers. The sentiments are from Nursery Necessities and were stamped in Old Olive. 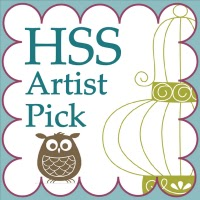 The papers are from the Sweet Pea dsp stack and a piece of 1/4 inch Chocolate Chip grosgrain ribbon finishes it off! Wow, long time no post! I've been crazy, busy with birthdays, a baby shower, doing the budget for Home & School and getting ready for a workshop next week. 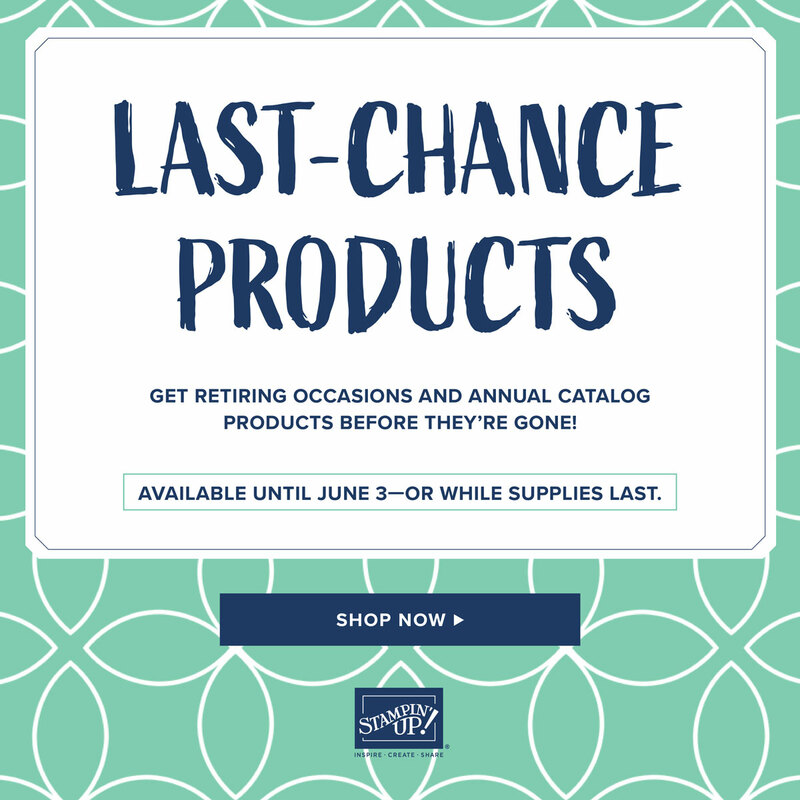 I'm trying to update my Stampin' UP! stamp set samples and I made this one for Fox and Friends. I thought it would qualify for the PPA#30 KISS here too. The Pumpkin Pie polka-dotted paper is from the Sweet Pea DSP stack. The giraffe is from Fox and Friends and Happy Birthday is from On Your Birthday. A piece of 1/2 inch striped Pumpkin Pie grosgrain finishes it off! 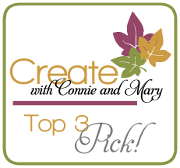 Look for more samples for my workshop coming up this week! 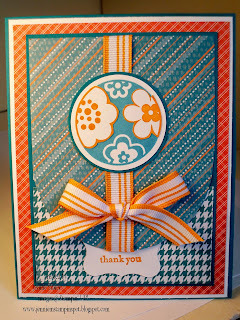 This spring colored card was made for the PPA#29 sketch challenge here. It came together really quickly and I like the simple design. 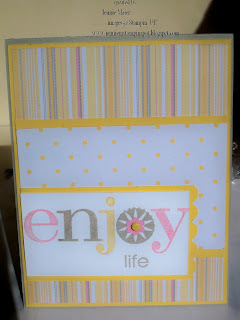 I used the Enjoy Every Moment stamp set and the papers are from the Sweet Pea DSP stack. The colors are Pretty in Pink, Sahara Sand and So Saffron. I colored the letters with Stampin' Write markers. I stamped the circle image in Sahara Sand and punched it out with the 3/4 inch circle punch. I stamped the tiny flower in Pretty in Pink, cut that out and added a Saffron brad to the center. "Life"was then stamped in Sahara Sand. Finally, the edge of the Saffron was punched with the Scallop edge punch. 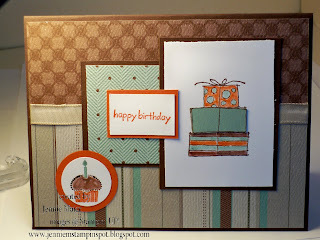 This birthday card is for the Splitcoast Color Combination#257 here and the Splitcoast Sketch Challenge #266 here. 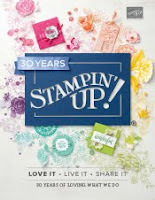 You can earn this stamp set, Happy Moments, with a $50 order now thru March 31st. I also used the cupcake stamp from Holiday Blitz. I colored two presents with blender pens and Chocolate Chip, Dusty Durango and Sage Shadow Classic stampin' pads. The middle present was paper pieced by stamping Chocolate Chip on Sage Shadow card stock then cutting out the image. The papers are from To the Nines Specialty DSP and the ribbon is Kraft taffeta. This thank you card was made with the MojoMonday sketch #125 here. The papers are from the Sweet Pea DSP stack and the stamp sets are Circle Circus and Teeny Tiny Wishes. I stamped the flowered circle image twice, once in Pumpkin Pie and then in Taken With Teal. I cut out two of the Pumpkin Pie flower images and adhered them over the main image. I then punched that out with the 1 3/4 inch circle punch and layered that onto a Taken with Teal piece that I cut out with the Coluzzle. 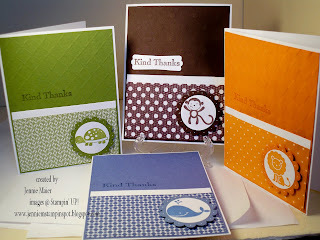 Thank you was stamped in Pumpkin Pie on a piece punched with the Curly Label punch. A piece of Pumpkin Pie 1/2 inch striped grosgrain finishes it off. This thank you card set is for my daughter's basketball coach who is expecting her first child in March. I used texturz plates, DSP, the 1 3/8 inch circle, Scallop Circle and Modern Label punches .The stamp sets are Fox and Friends and Thank You Kindly. Here's a Valentine card I made for the Stamping 411 Sketch #137 here. This one is going to my 11 year old son. I used the Loads of Love stamp set. 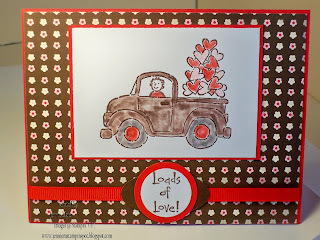 I stamped the truck, hearts and sentiment in Chocolate Chip on Whisper White. I used blender pens and Chocolate Chip, Pretty in Pink and Real Red inks to color in the images. 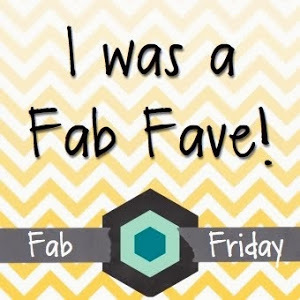 I punched the sentiment out with the 1 inch circle punch, layered that on a Real Red piece punched with the 1 3/4 inch circle punch and layered that on a Chocolate Chip piece punched with the Large Oval punch. A piece of 1/4 inch Real Red grosgrain ribbon finishes it off. In keeping with the Valentine theme, I made this Valentine's Day card for the PPA#28 Color Challenge here. The colors are Melon Mambo, Pretty in Pink and Basic Black. I started with a Melon Mambo card stock base and added some Melon dsp from Razzelberry Lemonade. There's also a piece of Pretty in Pink dsp from the Sweet Pea dsp stack. I stamped the heart image from With All My Heart in the middle and then the heart image from The More the Merrier on the sides, all in Melon Mambo. 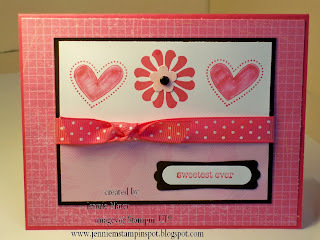 I stamped the little flower from With All My Heart in Pretty in Pink then punched it out with the Trio Flower punch. A black brad is in the center. "Sweetest ever" was stamped in Mambo, punched out with the Word Window punch and layered on to a piece of Basic Black, punched with the Modern Label punch. A piece of 1/2 Polka-dot Melon Mambo ribbon finishes it off. I've realized time is running out for making those Valentine's Day cards so here's another one. I used the Perfect Polka Dots textured impressions folder on the Pretty in Pink card stock base. I then used a piece of paper from Sending Love Specialty DSP and matted that on some Pretty in Pink and Real Red card stock. I colored the stamp from With All My Heart with the Pretty in Pink and Real Red Stampin' write markers. A piece of 5/8 inch Real Red Satin ribbon finishes it off. It's my sister's birthday on Sunday so I made her this card using the Mojo Monday sketch #124 here. Her card matches the little purse present I made here that she'll be getting this weekend. I started by running a piece of Real Red thru the Big Shot with the Perfect Polka Dots textured impressions folder. 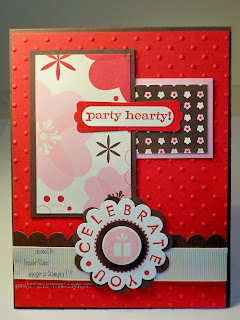 I used the Party Hearty stamp set by inking the "celebrate you"and "party hearty" in Real Red. I punched each out with the Scallop Circle punch and Word Window punch, respectively. I added the Modern Label punch in Real Red on the upper portion. I used Chocolate Chip from the Scallop Circle #2 Big Shot die under the bottom part. There's also a Chocolate Chip 1 inch circle punch layered under the Pretty in Pink present that was punched with the 3/4 inch circle punch and popped up with a Stampin dimensional. A piece of Chocolate Chip punched with the Scallop Edge punch and a 5/8 inch Very Vanilla grosgrain ribbon finishes it off. I'm double-dipping with this card. 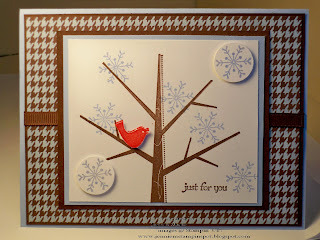 I did it for the PPA#27 Snowflakes Theme challenge here and the Stamping 411 sketch here. The hounds tooth paper is from the Sweet Pea DSP stack. The stamp set is Season of Friendship. I stamped the tree in Chocolate Chip and the snowflakes in Bashful Blue. The bird is in Real Red. The sentiment is from Teeny Tiny Wishes. A piece of 1/4 inch Chocolate Chip grosgrain ribbon finishes it off.